Lawn problems are endless. So you should really consider whether a lawn is necessary in your vegetable garden. …would be inappropriate for organic lawns as pathways. If you see a greenish, blackish slime developing on your organic lawn… Then know that it is algae. It’s also an indication that the lawn has poor drainage. You see…the lawn grass protects the pore spaces of the soil. And it’s these pore spaces that drains the soil. But when we roll the soil we destroy the pores. Additionally…if we underfeed or cut the grass too low we reduce its denseness. Thus the soil is more exposed. Rain drops can now have a greater impact on the soil causing the soil to compact. This too reduces the soil’s drainage capability. The less the soil can drain water…the more algae you’ll experience. 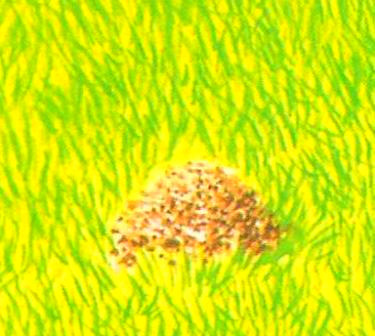 If you’ve got ant hills, then most likely your soil is too dry and sandy. Now ants aren’t so harmful to lawns, but they do disfigure the appearance. So it’s wise to get rid of them. For organic lawns and garden…scatter the hill with a broom. Then use a mower to cut the lawn. However if the lawn isn’t organic you can sprinkle an ant-killer on and around the hill. Dog urine (especially female dogs) contain chemicals and toxins. These dry up the lawn. Thus if the area where your dog urinates is drying up…then water the area vigorously. Water should drain out the toxins out of the soil. But if the grass still doesn’t recover after this…then you’ll have no choice but to reseed or re-turf the affected area. 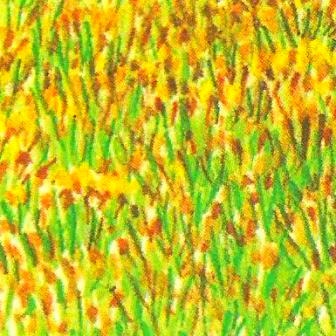 Brown tipping is where the tips of grass become brown after mowing. This occurs mainly when the mower blades are dull. The lawn grass isn’t cut cleanly. They are being bruised because of the dull blade. Another possible cause is mowing a wet lawn. 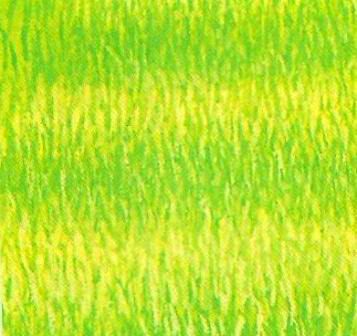 It’s best to wait until the grass has dried before cutting to avoid these lawn problems. If cracks appear on surface of the lawn…then it’s a water problem. The soil is too dry. The best way to fix this is by watering the entire lawn. Then patch the cracks with dirt. And finally, add a thin sprinkled layer of grass seeds. This problem can be avoided if the lawn (and especially a new lawn) is watered regularly. Installing garden watering systems like sprinklers for instance that automatically waters the lawn. 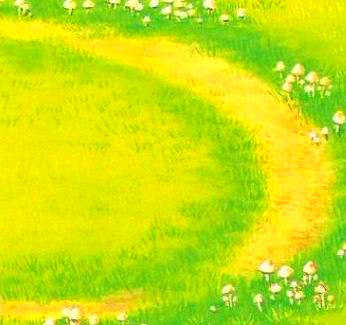 This is a ring of toadstools that grow wider and wider each year. They are parasitic and compete with grass for nutrients. And the worst species of toadstool is the marasmius. 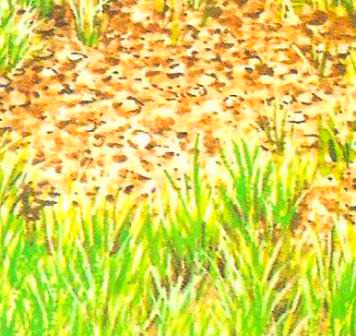 The work of the marasmius can be identified by two dark circles of grass with a bare space of soil in between them. The only real solution is to replace the soil and re-turf. If you overdose the lawn with fertilizer (both organic and inorganic) you’ll scorch the grass. Sometimes overdosing with fertilizers is done unconsciously. For example, spreading fertilizer in an area that was already fertilized. Or the borders of each area may be more concentrated due to overlapping. 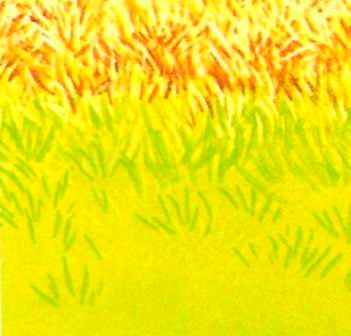 Once too much fertilizer is added, the grass becomes scorched and brown. Remedying this is quite simple. Water the affected area heavily as this washes the fertilizer out of the ground. The lawn will then recover naturally in 2 to 3 weeks time. This is the worst of all insect pests that cause lawn problems. 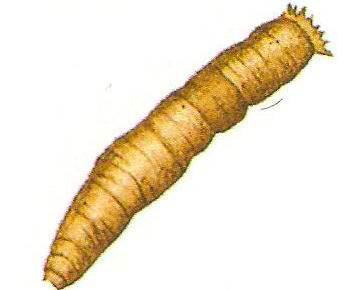 They harm lawns by feeding on the roots and stem bases of the lawn grass. 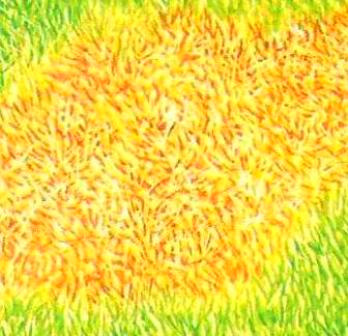 This causes the grass to become yellow or brown. This causes the leatherjacket to settle on the surface of the lawn. In the morning you can simply remove the carpet or plastic and let the birds feed upon them. 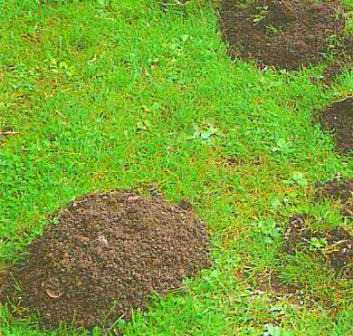 When moles are tunneling they destroy the root system of not only lawn grass but also vegetables. And the best way to get rid of them is to send for a professional. You see the poison and repellant used is too dangerous for amateurs like us (me included). However the mole hill that is left on the lawn surface should be removed before mowing. Scalping is where the lawn is shaved too closely. They can be easily recognized as bald spots in the garden. Scalps are caused more so by cylindrical mowers than rotary mowers. So if this is the case with you…then you can switch mowers. You can also raise the height of the cut if the soil is too bumpy (bumpy soil is another reason why scalping occurs when mowing). You should also improve the evenness of the soil by added dirt and top dressing. Stop refueling and oiling the mower or lawn cart or other mechanical lawn care devices on the lawn. Well…if you mow your lawn in the same direction you’ll notice a pattern developing. 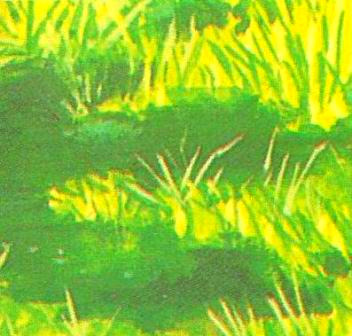 There’ll be a broad strip of dark-green lawn grass followed by a strip of light-green lawn grass and so on. That’s the wash-boarding effect. Now if you look at pro soccer…you’ll see this pattern on the playing field. And from what I’ve seen, wash-boarding is rather welcomed in this scenario. It’s an effect that the lawn in your backyard vegetable garden can do without. To resolve this problem…you can simply start mowing in another direction. And remember to constantly keep changing the direction in which you cut the lawn. So these are the most common lawn problems. And as we can see…some of these lawn problems are caused by our poor habits. Other problems (like moles for instance) may require a professional. First take into consideration the size of the garden. If the garden is small then you can avoid these lawn problems by simply not planting a lawn. Use gravel or concrete as pathways. If the garden is large…then grow the lawn. But take care of your actions and who or what you allow on the grass.